So You Don't Like the Bride. Now What? So, you really don't like and can't stand the bride. Now What? You're invited to the wedding but you're dreading it. There are some satirical yet rude ways some people choose to express their dislike, although it's always advisable to take the high road. You wouldn't wear a glitzy, shimmery red dress to a solemn ceremony, would you? No way! You want to show respect for such a tragic occasion. To mourn the union of a beloved groom and a bratty bride, it's imperative to wear the most depressing black outfit you can find in your closet. Top it off by wearing one of those ridiculously conspicuous derby hats and you're all set. While making sure the bride is within earshot, sympathetically pat the groom on the back and say, "I wish you peace and healing as you walk through this valley of sorrow." Tear up, blow your nose obnoxiously, and walk away. You know that guy who was always in the back of the bride's mind? The one who makes the bride wonder, "What if?" Yeah. Bring that guy as a date. Innocently tell the bride that you thought it would be such a nice surprise to bring an old friend of hers to witness this solemn - er - glorious celebration of love. Might be wishful thinking, but if she takes the bait, she just might bail on the groom and go ruin that other guy's life instead. Clink your champagne glass! 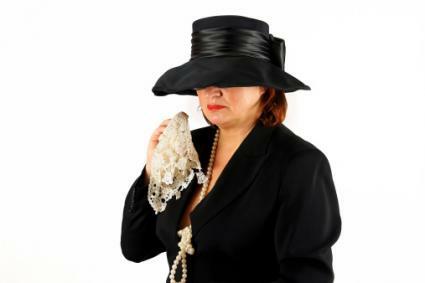 It's time to give the kind of wedding speech that will keep the future wife up at night wondering if you were being shady, while the husband assures her that she's totally being paranoid. We suggest you say, "I see that the bride is wearing a gorgeous white dress because it's the happiest day of her life. But then you gotta wonder, why is the groom wearing black?" Pause for laughter. "Thank you, thank you! I'm here all week." Head over to the DJ and tell him that you'd like to dedicate a song to the groom. Grab the mic and say, "In honor of the newlyweds, I'd like to play a song that truly expresses my deepest sentiments towards the new couple." Choose tunes such as The Beatles' Run For Your Life, Kanye West's Gold Digger, and Tammy Wynette's D-I-V-O-R-C-E. Then sit back, and watch the steam come out of the bride's ears. 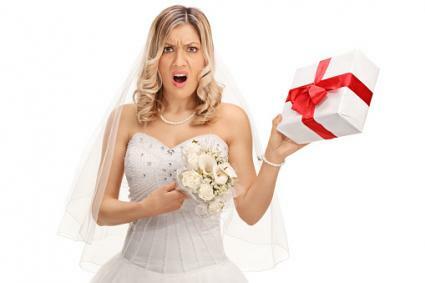 Get the bride a handful of how-to books to insinuate her incompetence. Make sure the subjects being taught are insultingly elementary. Titles such as The Complete Idiot's Guide to Pleasing Your Man, Cooking Basics for Dummies, and A Step-by-Step Guide to Making Your Home Mother-in-Law Approved should do the trick. Slip a note inside the gift package that says, "You're going to need these..."
You can hear a pin drop in the church as the officiant weds this pitiful union. But just as he or she says, "Speak now or forever hold your peace," drop a bunch of marbles all over the floor at your pew. "Oops! Looks like someone's lost their marbles today," you should say innocently, while alluding to the groom's screwball decision to marry this she-devil. Ah, the harmonious sounds of a baby crying at the top of his or her lungs. What a melodious addition to the tranquil, serene ambiance of a wedding ceremony! Make sure you sit in the front row to drown out those dreaded I do's. The bride will surely thank you for refusing to step outside of the venue with your wailing infant. 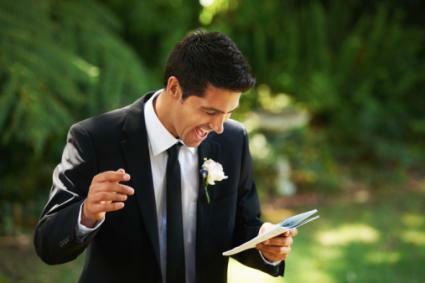 Will these tips help you save the groom from the biggest mistake of his life? Maybe, maybe not. But it's important to note that though you may have the groom's best interest, the heart wants what the heart wants - even if it is the devil incarnate in a wedding dress.